For their second residency at the academy, the Lakeside Trio were once again an inspirational presence. A masterclass involving several of the island’s young pianists took place on one evening, and the following evening they preceded their concert at the academy with a pre-concert presentation of Schoenberg’s Verklacht Nacht. This gave a fascinating insight into the poetry which underpins Schoenberg’s music, and in particular the way that each musical motive heard is ‘transformed’ towards the end of the piece to give a beautiful sense warmth and expression to the work. Their performance in the concert following this presentation was exemplary, in which the insights gained from the pre-concert event added a whole new dimension to the experience. The concert also included Schubert’s expansive Piano Trio in E flat, one of the fundamental works for piano trio, and Panufnik’s Piano Trio op.1, a modern but highly accessible work showcasing virtuosity from each off the instruments. 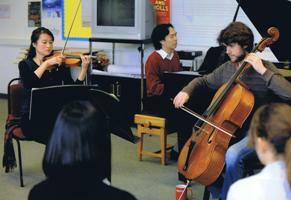 The Lakeside Trio’s residency was once again sponsored by the Jersey Arts Trust.